YAY it’s finally getting warmer here in Jersey and it couldn’t come soon enough! It’s the weather for lighter foods and sorbets, for icy drinks and cooling foods. It’s the time for firing up the grill, eating outdoors and making foods that transport you to the beautiful Caribbean Islands like this cool and refreshing spicy mango salsa recipe. With only a handful of simple ingredients you can turn a bland dish into a vibrant and more appealing meal. Just chop up a few ingredients, mix and let it rest so all the flavors blend well. The salt will help draw out the moisture of the mangoes for a juicier bite each time. Use it to top grilled chicken, pork chops or enjoy it with tortilla chips. Either way, its a sweet, savory and spicy flavor you will want to make all Summer long. Mix all ingredients in a bowl and add salt and pepper to taste. Let the mixture sit for at least an hour for best flavor. I made these amazing granola pancakes with spicy cherry compote this past weekend. These are not your fancy pants homemade pancakes but the good ol’ trusty Bisquick kind! I truly wanted to make some from scratch after seeing this healthier homemade version from the Whole Grain Mornings cookbook on Smitten Kitchen but decided on convenience. I don’t make pancakes that often so that yellow container you easily spot down the pancakes aisle was just too tempting. Besides, I made the spicy cherry compote from scratch and added healthy granola to the mix for some added nutrition. I don’t really like sweets early in the morning but this would be great for brunch. Wouldn’t you want to wake up to this on Valentine’s Day after you’ve slept in and rolled out of bed? The spicy cherry compote will add some extra heat to your day and the a scoop or two of KIND healthy grains clusters will keep you full for a while. You can add your own granola but these clusters contain flax seeds, quinoa, oats for a bit of crunch and wholesomeness. I think I’m making these again. Sweet, sour, hot cherries would also be great on ice cream or oatmeal. Hope you have a wonderful week! Crush the cherries and remove the pits. Add to a saucepan on medium heat then add the water, jalapeno, lemon, sugar and cinnamon and stir until well mixed. Let mixture come to a boil and cook down liquid until syrup thickens. Remove from heat, then remove and discard the jalapenos. Make pancakes according to instructions on container but stir in the granola before pouring. Serve pancakes with syrup and top with cherry compote. One thing I can’t resist when I go to the mall are those soft, buttery, pretzels from Auntie Anne’s. You know the ones, the smell hits you way before the pretzels come into view. They’re not the healthiest and covered in butter but they’re my little indulgence to get me through the next couple of hours of shopping. My favorite are the jalapeno pretzels so naturally I had to try my own version! These are more “New York style” pretzels rather than the chain’s version and much healthier too. No greasy, oily film covering them. I like the mall pretzels but something about making your own feels so much better eating! These pretzels are soft and chewy and have just enough heat to keeps things interesting. They’re best when they’re fresh out of the oven and even better with spicy mustard! You’re probably thinking “oh, I have no time for this”, but really, you do! With just a few simple ingredients to mix, a little time for the dough to rise and another few minutes for baking and voila, a New York style pretzel you didn’t have to travel all the way to city to get! That simple. 1. Mix the first three ingredients and add warm water until mixture dissolves. Set aside until yeast mixture gets foamy. 2. In separate bowl mix flour and nutmeg then mix butter in with fork until mixture appears like crumble. Use fingers to mix if that’s easier. 3. Slowly add yeast mixture into flour and stir. Add chopped jalapeno peppers and mix with hands until you form a dough. Knead the dough until smooth and not sticky. Cover with plastic and let the dough rise for an hour, or overnight in the refrigerator. 4. Cut dough into 6- 8 pieces and roll out each into a long log. Shape each into your desired shape and place on a oiled baking sheet. Let the dough rise again for another 30 minutes. 5. Preheat oven to 45o. Add baking soda to a pot of water over high heat and let boil. Boil each pretzel, a couple at a time and set a rack to drain. 6. Sprinkle pretzels with sea salt and place back on baking sheet. Bake for 15-20 minutes until brown. Happy pre – St. Patrick’s Day!! 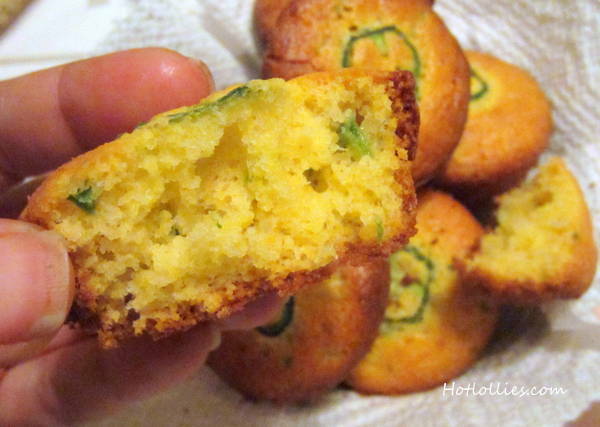 Celebrate with these jalapeno and cheddar cornbread muffins for a spiced up morning. They’re playful, fun, easy to make and would look cute on your breakfast table. During the baking process the jalapeno slices transform into little shamrocks! 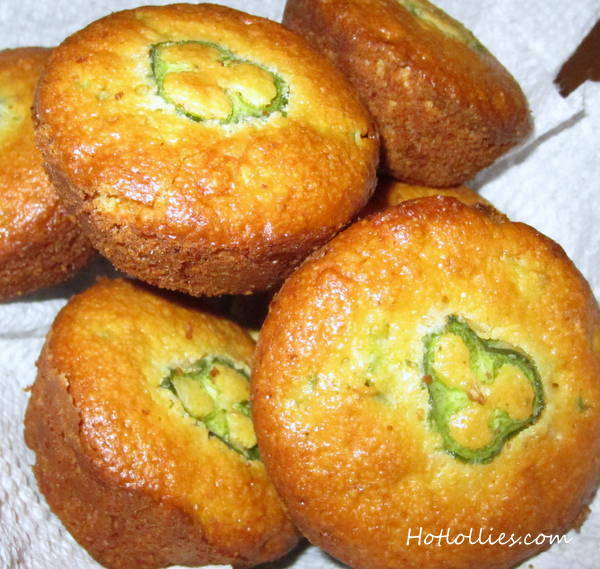 Just slice an extra jalapeno and top each muffin before baking. The cornbread muffins will be just a little spicy since the fat in the cheese helps balance the heat. 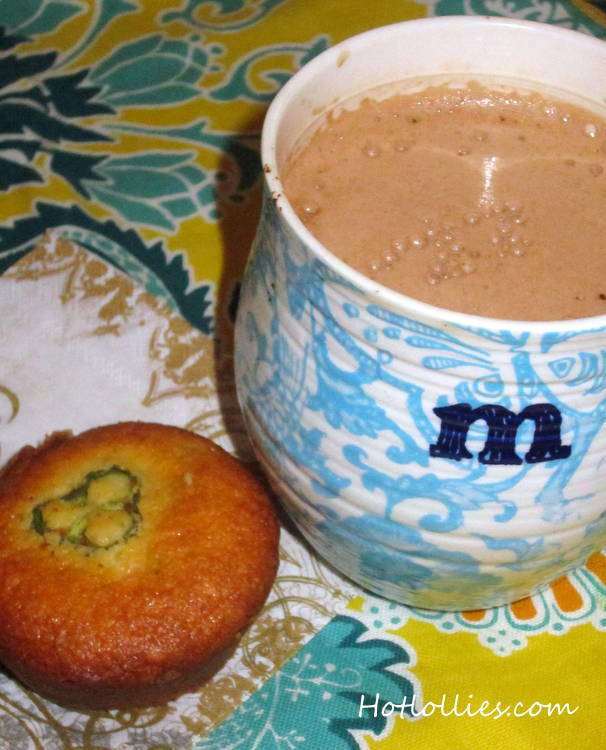 Perfect with a mug of coffee! I used regular cornbread mix which works for me! Its quick, it’s easy but if you have your own special corn muffin recipe go ahead and just mix in the jalapenos and the cheddar. Adjust your recipe if you add salt since the cheddar adds it’s own saltiness. Also, adding the cheese makes this recipe much more moist than a traditional cornbread recipe. Enjoy your St. Patrick’s Day and may the road always rise up to meet you!! 1. Preheat oven to 350 degrees. In a medium bowl mix all ingredients except the sliced jalapeno. 2. Grease a muffin pan and pour cornbread mix into molds. 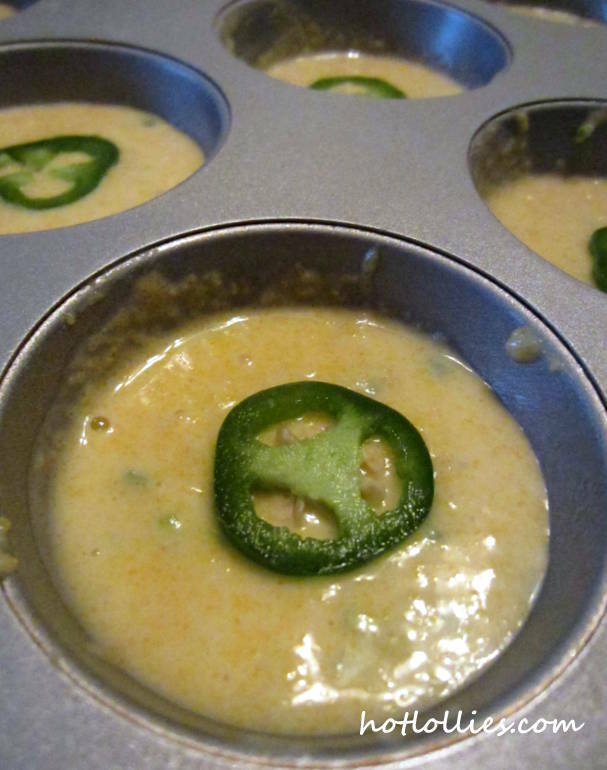 Top each muffin with a jalapeno slice and bake for 20-25 minutes. 3. For a sweeter option, drizzle a little honey over the tops as they’re cooling. This quinoa bites recipe has been on my Pinterest board for over a year now. I’ve made it a couple of times and decided to tweak the recipe for a spicier option. What can I say, I just can’t help myself! Adding a little spice here and there can really elevate a dish, even if it’s just a few pepper flakes. 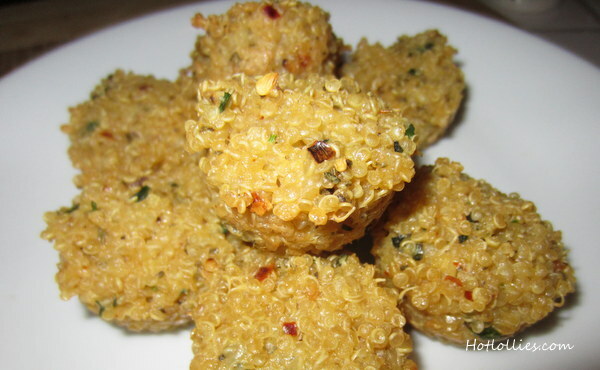 These spicy quinoa mini cakes are a healthy alternative to the numerous fried and cheese laden appetizers that will be consumed during next weekend’s super bowl. If you’re looking for ideas on what to make and want to balance out your menu, this is it! Quinoa is a grain used in many dishes across South America and has gained popularity across the US for it’s high protein content and health benefits. It’s the super food of choice for vegetarians and non-vegetarians alike. It’s high in fiber, rich in iron and has been known to regulate insulin levels in your body. How could you not want to eat this?! These are great little snacks you can munch on between meals, as appetizers or just serve up as a side dish. The original recipe called for a sauce but these are moist enough that you don’t need one. If you do want something extra, serve with a salsa. You can also use regular size cupcake pans and serve as a side with vegetables or grilled chicken. 1. In a small bowl add all the ingredients and mix well. 2. 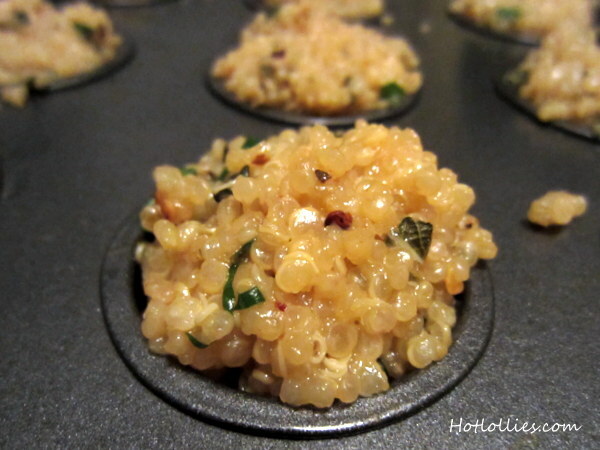 Grease a mini cupcake pan and spoon in the quinoa mix into each mold. 3. Bake at 350 degrees for 20 minutes. Note: The recipe calls for 2 cups of cooked quinoa. You can cook 1 cup of quinoa in about 1 1/2 cups of chicken or vegetable stock for extra flavor. I used a low sodium chicken stock and boiled quinoa for about 15 minutes. You want the quinoa to crack open and be light and fluffy. Quinoa has too many health benefits not to include in your diet. Use any leftover cooked quinoa to toss in your salad or add some texture to your smoothies. Enjoy!